Researchers in UC Santa Barbara Professor Yasamin Mostofi’s lab identified that common communication signals such as Wi-Fi could work for things like counting crowds at an event, through walls. The technique requires a wireless transmitter and a wireless receiver. The Mostofi Lab extensively tested this technique in different locations, through different wall properties and with several different numbers of people in the room. With only one Wi-Fi link, the technology had a counting accuracy of just being off by two people or less 100% of the time. 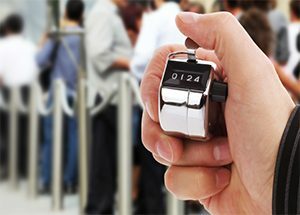 Crowd counting is the act of counting people at an event or in one space. In the past, people performed the counting manually. Now, there’s technology that can do it for you, and through walls, so you don’t have to be in the same space. How do the transmitter and receiver work through walls? To set up this technology, researchers set up one Wi-Fi transmitter and one Wi-Fi receiver behind walls, outside of the room where many people gathered. The wireless transmitter sends a wireless signal, and the wireless receiver measures its received signal strength (RSSI). By only using the power of the received signal, the receiver can estimate how many people are in the room. The researchers did not do any prior measurements or calibrating the transmitter or receiver. It is also noteworthy that to set up this technology, they only needed off-the-shelf Wi-Fi transceivers, nothing fancier. The days of tallying on paper the number of people at an event may be behind us. This technology could have a variety of applications, including smart energy management, or retail business planning and security. View the Mostofi Lab video Through-Wall Crowd Counting with WiFi.